Welcome to the STORRER web home page! Cell phone and World phone numbers available upon request. 2. Dr Storrer's latest findings regarding FRANK LLOYD WRIGHT via a link to the web version of the FLlW UPDATE newsletter. This is now a link to FrankLloydWrightInfo.com. When you open this new site, please bookmark it! 4. Are you a blood relative of the Storrer family? We have listed all names that have a known blood relationship to the Storrer surname. 8. Bill Storrer biographical information at "Bill Storrer, PhD, including photo galleries." You will also find a bio at "www.JetSetModern.com" in their issue #4. 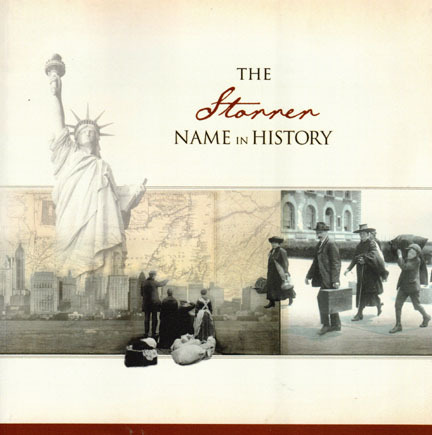 The Storrer Name in History is published by Ancestry.com. It is about the "name," not the history of the family Storrer, nor genealogy. Most of what is in this tome, printed on-demand by Borders, is about British, not German or Swiss-German, Storrers. Since we have yet to find an English Storrer who will agree to a DNA test, we have no concrete knowledge of a link between the Island and the Continental Storrers. To go to a page, click on it! The materials in this and related web pages are copyright © MMXII by William Allin Storrer. Updated 1 December 2012.